Hunting Easter eggs is the perfect time to use the colors of the eggs to point children (and adults) to Jesus! 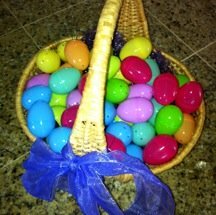 Have a basket of various color eggs or at least one Easter egg for each color (most come in purple, orange, pink, blue, green & yellow). You could also pass out eggs for each child to hold as you talk, & then they can lift up their egg when the color is called. Hello! I have brought a basket full of Easter eggs today! Look at all the pretty colors! There are purple ones, orange ones, pink ones, blue ones, green ones, and yellow ones! Wow, God was so creative when He created colors! 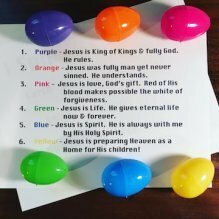 Did you know that the colors of these Easter eggs can remind us of some wonderful truths about Jesus?! PURPLE: If you have a Purple egg, hold it up for us. Purple is the color of royalty; it helps me remember Jesus is the King of Kings & fully God and when the Bible begins with “In the beginning God…” Jesus was there in Heaven ruling as God the Son! ORANGE: Anyone holding an Orange egg? Orange is the color of some dirt or clay; it helps me remember that Jesus came to earth as fully man. He left Heaven and came to live as a man here on earth yet He never sinned. PINK: What do you think of when you think of Pink? Who has a Pink Easter egg? Pink makes me think of love! Did you know that Pink is made by mixing the color red with white? Red reminds me of Jesus' blood that He gave when He died on the cross so that we can have forgiveness for our sin (washed & made white as snow)…so pink reminds me of God’s great love. GREEN: Green is the color of the grass, trees and so many other things that grow. Who has a green Easter egg? Green reminds me of the new life Jesus gives me when I trust Him as my Savior and it also reminds me that I continue to grow in knowing Him as I study the Bible, pray, serve & obey Him. BLUE: Blue Easter eggs make me think of the sky and the air around us. We can’t see the air, but we can see it’s affects when the wind blows and moves the leaves or we feel the breeze. This reminds me that Jesus is always with me through His Holy Spirit although I can’t see Him with my eyes. 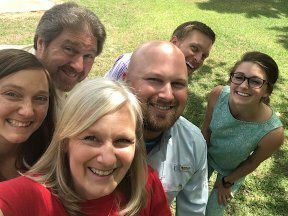 John 14:16-17 "I will ask the Father, and He will give you another Helper, that He may be with you forever; that is the Spirit of truth, whom the world cannot receive, because it does not see Him or know Him, but you know Him because He abides with you and will be in you." YELLOW: Yellow is like the sunshine; hold up any yellow Easter eggs. It reminds me of Heaven full of light and warmth because God is there. God promises that if we trust in Jesus as our Savior & Lord, then Heaven with Him will be our home one day for eternity. John 14:1-6 - “Do not let your heart be troubled; believe in God, believe also in Me. In My Father’s house are many dwelling places; if it were not so, I would have told you; for I go to prepare a place for you. If I go and prepare a place for you, I will come again and receive you to Myself, that where I am, there you may be also. And you know the way where I am going.” Thomas said to Him, “Lord, we do not know where You are going, how do we know the way?” Jesus *said to him, “I am the way, and the truth, and the life; no one comes to the Father but through Me." So as your hunting Easter eggs today and even later, I hope you will be reminded of Jesus whenever you see these colors! Purple – Jesus is the King of Kings; He is fully God & rules over all. Orange – Jesus was fully man; He understands. Green – Jesus gives new life, eternal life. Blue – Jesus is always with me through His Holy Spirit. Yellow – Jesus is preparing a home for believers in Heaven. Take time to pray and thank God for sending Jesus that we can be forgiven and rescued from sin & hopelessness. Yes, it is. Just like God gives us salvation. It is not something we earn or have to work for; it is a gift. We just have to accept it and receive Jesus as our own Savior & Lord. Have them open their eggs and see the candy. Jesus is sweeter than any gift of candy! As you hunt eggs today, they will be filled with sweet things; let those remind you of God's sweet gift of eternal life through His Son, Jesus Christ.